based in Suffolk and London. In his artwork, the artist has combined juxtapositions of found images with closely observed nature and pure invention to create stunning, richly detailed works of art. The subject of Allan's most recent paintings is the landscape of Suffolk and in particular, the eroding coastline of Covehithe. 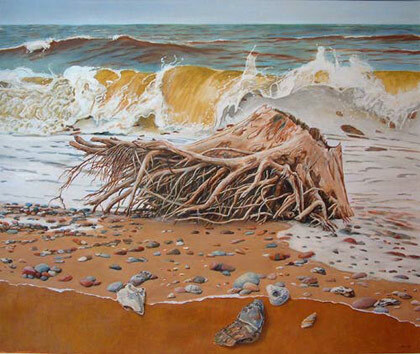 In his paintings Covehithe Erosion Zone 1 and Ghosts of Benacre Allan has skilfully captured the way the ever changing light picks out the colours in the waves breaking on to the North Sea coast. Allan has just completed a lottery funded project Before London 2012 whereby he has recorded the pre-development London Olympic site in paintings, together with portraits and sound recordings of older people who have lived and worked in that area. Allan offers a unique personalised portrait painting service, allowing you to have a portrait painted in the style of a famous artist. Allan also paints house portraits - from town houses to country cottages. Most recently, Allan has begun offering portraits for weddings and special occasions as well as pet portraits. All artworks are for sale unless otherwise indicated. Commissions are also undertaken. Please contact the artist for further details. Have a portrait painted in the style of a famous artist. Capture your pet on canvas with a precious pet portrait. Record a special day with a unique portrait. Weddings are a speciality.